Not all Spalding basketball backboards are the same, and not all mounting brackets on Spalding basketball systems are the same either. Below, I have compiled a list of frequently asked questions concerning replacing and purchasing a backboard for a Spalding basketball hoop. 1. Will this Backboard work with my system? This question is most frequently asked when replacing a broken backboard. First step to knowing if a certain Spalding backboard will work on your system is to know if your current system is made by Spaldingor Huffy. If it is, then we are on the right track. Spalding basketball backboards willlikely not work when used on any other basketball system made by a different manufacturer. Next, what is the size and shape of your main pole on your system? For this question we are wanting to see 3.5-inch round. This size and shape of pole helps determine whether the width of the mounting bracket is compatible with the width of the mounting uprights on your replacement Spalding basketball backboard. Lastly, can you see a y-shaped bracket that attaches to the back of your current backboard. This bracket is what will be used to attach to your new backboard; thus, if you do not have a y-shaped bracket on your current basketball hoop, the bracket might not be able to attach to the new backboard your order. Most of our Spalding Basketball Backboards on our website have compatibility charts you can go off. Also, contact Spalding at 1-800-558-5234 to be sure. 2. 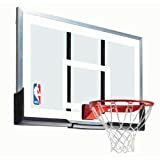 What Size of Backboard do I Need? While it is always safe to maintain the same sizes when replacing a backboard, it is actually not necessary with dealing with Spalding basketball backboards. 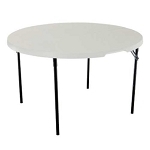 For instance, if you successfully answered the questions asked in FAQ 1 above, then your current pole and bracket system might accept backboards sized 44 inches wide to 54 inches wide. You should verify first by contacting Spalding's customer service line 1-800-558-5234. 3. Which Kind of Spalding Basketball Backboard Replacement is Best? This question deals with the different materials and design features used on Spalding backboards. Backboard materials range from plastic framed in plastic to acrylic framed in plastic to polycarbonate framed in steel.Whenever budget permits, always get a Spalding backboard framed in steel. The steel frame makes the backboard much more rigid and will thus produce a better rebound when the ball bounces off. A plastic framed backboard absorbs a lot of the impact of the ball and will thus weaken the bounce. Steel frames are the way to go. You can check out our entire line of availableSpalding Basketball Backboard Replacements here and start finding the right one for you. If you need some assistance determining which Huffy or Spalding basketball backboard replacement will be best for you, or if you have any compatibility questions, you can reach us at 1-866-308-5484. What If I Just Want to Mount a New Backboard at My Home? Spalding makes a few different backboard mounting kits that allow you to mount the backboard to a garage, roof, wall or pole etc. many of them also feature height adjustment mechanisms so that you can lower them for a younger child to learn how to shoot properly or for another player to practice dunking at a lower height. What are your thoughts of the Spalding 79351 Basketball Backboard?